Tucked between Emerald Bay and South Lake Tahoe lies 3-mile-long Fallen Leaf Lake lined with historic mountain cabins and tiny docks. And, the massive Mount Tallac dominates the skyline above. 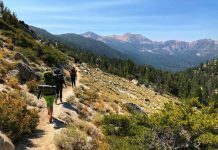 Glen Alpine, one of the most popular trailheads into the heart of Desolation Wilderness, begins near the southern tip of the lake, and the trail to the top of Tallac starts close by. Fallen Leaf Lake is loaded with old-fashioned ambiance and rustic character, which gives you the feeling that at least in this little part of the Sierra, time has truly stood still. But a trip to Fallen Leaf Lake is not a quick one. 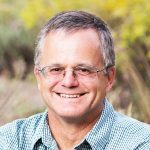 For most of the 5 miles from Highway 89 to the tip of the lake, the road is only 1½ lanes wide, and for the last 2 miles, the road narrows to just one lane, requiring drivers to pull over frequently to allow the car coming from the opposite direction to pass. Breathe, relax and enjoy the scenery. Fallen Leaf Lake, similar to Cascade Lake and Emerald Bay, to the north, was created by glaciers scouring out the landscape, leaving lateral moraines on both sides. While in Emerald Bay, the glacier kept going and opened a connection with Lake Tahoe. At Fallen Leaf Lake, the glaciers stopped and deposited a terminal moraine just a mile or so before reaching the Tahoe lakeshore. Fallen Leaf Lake has a maximum depth of 415 feet, and clean, clear water that is still used for drinking. 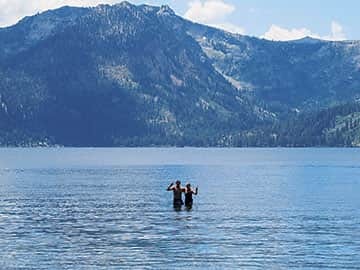 The lake and Glen Alpine Spring, located a few miles upstream, were a common summer home for the Washoe people for thousands of years. In 1898, Fallen Leaf Lake Lodge was constructed, providing rustic tourist accommodations. Later, it became the Stanford Sierra Camp, which is still in operation. 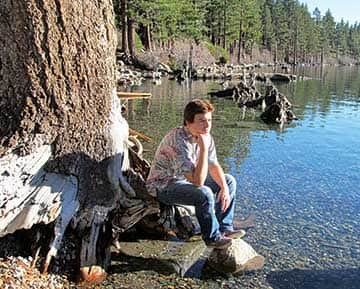 Some of the Tahoe regions most beautiful hiking trails begin at Fallen Leaf Lake. There is a general store and restaurant with great views overlooking the lake next to the marina and boat launch. And, the pier at the marina makes a good spot for a swim. The Fallen Leaf Lake campground is located just a short distance off Highway 89 at the northern edge of the lake. Moraine Trail | Take this easy hike from the Fallen Leaf Lake Campground along the northern shore of the lake. Glen Alpine | The Glen Alpine trail starts 2 miles past Fallen Leaf Lake at the end of the narrow, one-lane road. 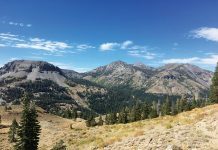 The trail follows gravel and dirt roads to the remains of the Glen Alpine Springs, then becomes a hiking trail heading into the heart of the Desolation Wilderness with Susie, Heather, Half Moon, Gilmore and Aloha Lakes all within 6 miles (each way). You can also use this trail to access Mount Tallac, although I prefer the views from the Mount Tallac trail. 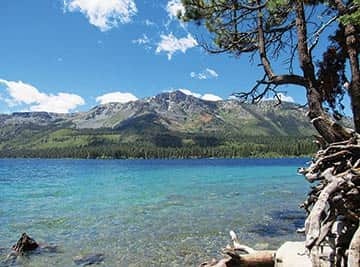 The Tamarack Trail | This trail has one of the toughest climbs to be found on any route around Lake Tahoe, but it is lightly traveled and provides amazingly beautiful views of Mount Tallac, Fallen Leaf Lake and Lake Tahoe. The trail begins about 100 yards before reaching the Glen Alpine Parking lot. After 3 miles of steepness, the trail reaches an overlook of Echo Lakes, and then continues gently on to Lake Aloha, where a loop will bring you back to the Glen Alpine trailhead in 12 miles. 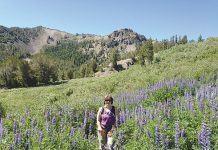 Mount Tallac Trail | The Tallac trail is located at the end of a mile-long road, which is accessed via Highway 89, just a short distance north of the turn off to Fallen Leaf Lake. It’s a 10-mile round trip with about 3,300 feet of climbing, much of it along the lateral moraine above Fallen Leaf Lake. While the view at the top is sublime, the entire journey is spectacular. Kayaking & SUP | Launch your personal paddling craft for free at the Fallen Leaf Marina. Stay close to shore to avoid motorboat traffic, and perhaps, if you have the energy, circle the lake. For more information, visit fallenleaflakecsd.org or .